Herbal Daily Conditioner by Nature's Gate leaves my hair feeling healthy and clean. The bonus us that it smells amazing! Herbal Daily Cleanse Conditioner by Nature's is a great product for a great price. Smells amazing and leaves hair feeling super smooth. I have purchased Herbal Daily Conditioner by Natures Gate before and love it. I love the smell. Its addicting. My hair comes out silky soft. 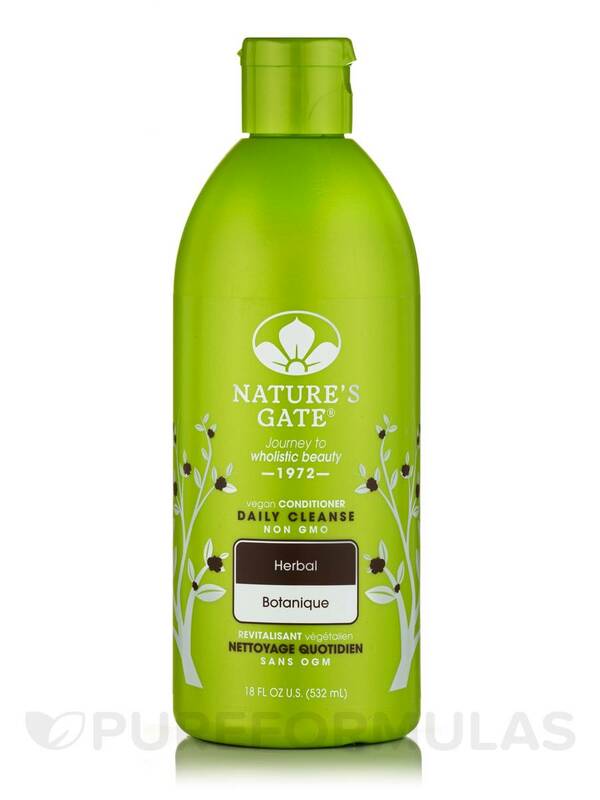 Reveal shiny and bouncy hair by using Herbal Daily Conditioner from Nature’s Gate®. Containing an effective blend of herbs that condition hair‚ leaving it smooth‚ soft and detangled after every wash.
Hydrolyzed quinoa is a protein containing all eight essential amino acids. It may help repair‚ protect and condition hair. It protects the strands to leave them smooth‚ strong‚ and hydrated. Oils of jojoba and borage are known to moisturize hair and keep moisture locked in the strands to make them more manageable. 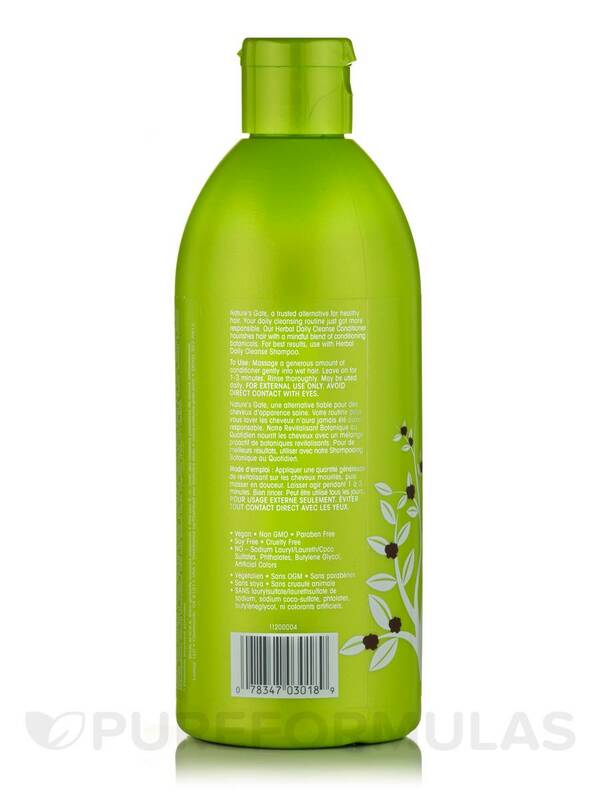 Chamomile flower extract in this conditioner from Nature’s Gate® may soothe scalp irritation‚ nourish hair and lend a healthy glow to the locks. Nettle leaves are rich in sulfur and silica and they help keep hair healthy and shiny. Lavender extract keeps your scalp hydrated and prevents itchy conditions. Burdock root extract contains many beneficial compounds that help nourish hair. Sacred lotus extract helps impart natural shine to hair and reduces split ends. 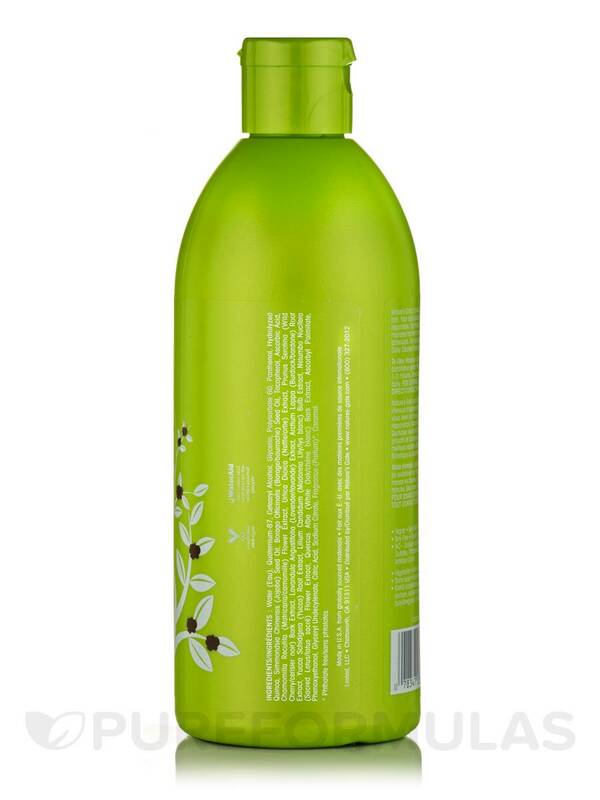 Incorporate Herbal Daily Conditioner From Nature’s Gate® to your hair care regime and add new life to your hair. Ingredients: Water (Eau)‚ Quaternium-87‚ Cetearyl Alcohol‚ Glycerin‚ Polysorbate 60‚ Panthenol‚ Hydrolyzed Quinoa‚ Simmondsia Chinensis (Jojoba) Seed Oil‚ Borago Officinalis (Borage/bourrache) Seed Oil‚ Tocopherol‚ Ascorbic Acid‚ Chamomilla Recutita (Matricaria/camomille) Flower Extract‚ Urtica Dioica (Nettle/ortie) Extract‚ Prunus Serotina (Wild Cherry/cerisier noir) Bark Extract‚ Lavandula Angustifolia (Lavender/lavande) Extract‚ Arctium Lappa (Burdock/bardane) Root Extract‚ Yucca Schidigera (Yucca) Root Extract‚ Lilium Candidum (Madonna Lily/lys de la madone) Bulb Extract‚ Nelumbo Nucifera (Sacred Lotus/lotus sacré) Flower Extract‚ Quercus Alba (White Oak/chêne blanc) Bark Extract‚ Ascorbyl Palmitate‚ Phenoxyethanol‚ Glyceryl Undecylenate‚ Citric Acid‚ Sodium Citrate‚ Fragrance (Parfum)*‚ Caramel. Allergen Caution: Contain Non GMO‚ Paraben‚ Soy‚ Cruelty‚ No – Sodium Lauryl/Laureth/Coco Sulfates‚ Phthalates‚ Butylene Glycol and Artificial Colors. I really like that this Herbal Daily Cleanse Conditioner by Nature's Gate is all natural. Makes hair smooth. Great smell too. Some people complain about the smell but it is my favorite, all natural, and it goes away after an hour. Herbal Daily Cleanse Conditioner by Nature's Gate covers well and leaves hair soft, but the fragrance is overpowering, like the shampoo. To me it smells like sandalwood or nag champa incense, and it's very strong. This would be a positive for some people. But I prefer, and was expecting, a lighter, herbal scent. Unfortunately it's so strong I will not be using it. I have had such a hard time finding a more natural conditioner that actually works well on my hair. I have thick, naturally curly hair. Many of the products I've tried have left my hair oily and sticky. Herbal Daily Cleanse Conditioner by Nature's Gate has been awesome and it smells great! It is definitely my new go to conditioner! I started using Herbal Daily Cleanse Conditioner by Nature's Gate as a teenage - my mom had it in the house, and I loved it. Over the years, we drifted apart, until one day, visiting my mom, I used it again in the shower. Later that afternoon, I gave my brother a hug. "Mmm, Nature's Gate!" he exclaimed, as he smelled my hair. I then remembered how much I love the smell, how soft it makes my hair, and how shiny my hair becomes! My favorite! Smell, how soft it makes my hair. Been using Herbal Daily Cleanse Conditioner by Nature's Gate over 10 years! makes my hair super soft and smells so great! Is the only conditioner I use!! Herbal Daily Cleanse Conditioner by Nature's Gate has it all for my fine thin hair! Been using since junior high school. The smell is exhilarating! It makes my hair so soft and need very little! I add a tiny bit as leave in conditioner & it adds major volume. I hope this product is never discontinued! NaturesGate products are awesome and affordable, I use many of them!!! Thanks NaturesGate! Loyal customer for decades!! They watered it down years ago, they sent me freebies when I asked why, awesome for them to do this!! Herbal Daily Cleanse Conditioner by Nature's Gate helps remove the built-up of other products. Other conditioners promise this, but this one delivers. Wanting to steer toward some more natural solutions, I tried Herbal Daily Cleanse Conditioner by Nature's Gate out. It doesn't quite address the fly-away hairs as much as I hoped but it does keep my hair soft. The perfume is however too much, makes me sneeze in the shower, but whatever... my wife seems to like the scent. Nice texture, keeps hair soft. Overpowering perfume makes me sneeze. Detangles well but smells too strong. I wanted a natural conditioner at a good price to detangle my curls. 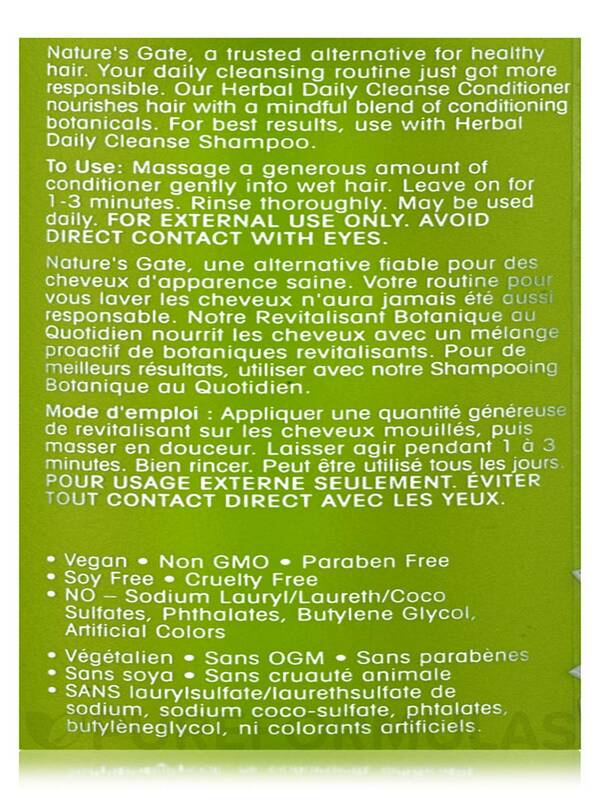 Herbal Daily Cleanse Conditioner by Nature's Gate does detangle very well but the smell is too strong and chemical like. Also I found that it made my hair frizzy. Overly powerful scent and left my hair frizzy. why aren't I finding your herbal conditioner in any size larger than 18 oz ? Hi Susan. As of right now the 18 fl oz is the only size we carry. We thank you for bringing this to our attention as we will request the 32 fl oz to be added into our inventory.